Emerald_Island_2718 in Kissimmee is a holiday home with 1 room. 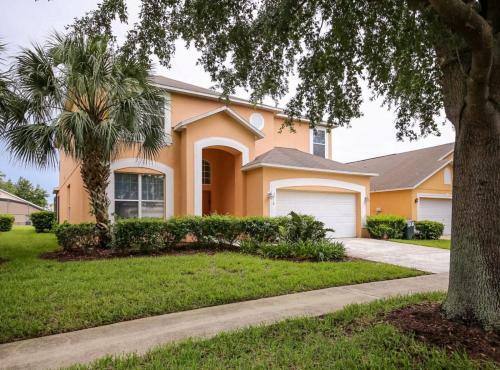 Located 18 km from Kissimmee Value Outlet Shops, Emerald_Island_2718 is situated in West Kissimmee district of Kissimmee. The property is 20 km from 192 Flea Market and 21 km from Plaza del Sol Kissimmee. With free WiFi, this 7-bedroom holiday home offers a flat-screen TV and a kitchen with dishwasher. Guests can make use of the hot tub. This property features an outdoor swimming pool. Fun 'N' Wheels Fun Park is 21 km from the holiday home, while Kissimmee Sports Arena & Rodeo is 24 km away. The... nearest airport is Orlando International Airport, 41 km from Emerald_Island_2718. Located 18 km from Kissimmee Value Outlet Shops, Emerald_Island_2718 is situated in West Kissimmee district of Kissimmee. The property is 20 km from 1...92 Flea Market and 21 km from Plaza del Sol Kissimmee. With free WiFi, this 7-bedroom holiday home offers a flat-screen TV and a kitchen with dishwasher. Guests can make use of the hot tub. This property features an outdoor swimming pool. Fun 'N' Wheels Fun Park is 21 km from the holiday home, while Kissimmee Sports Arena & Rodeo is 24 km away. The nearest airport is Orlando International Airport, 41 km from Emerald_Island_2718. When would you like to stay at Emerald_Island_2718?